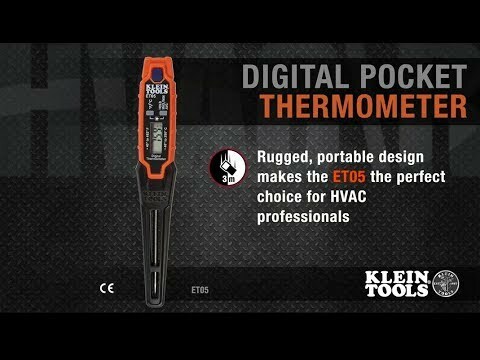 Klein Tools ET05 is a digital thermometer that takes ambient and direct-contact readings in both Fahrenheit (°F) and Celsius (°C) scales.The rugged, portable design makes it the choice of HVAC field service teams. The protective sheath cleverly serves as a handle to extend reach. Read, understand and follow all instructions, cautions and warnings attached to and /or packed with all test and measurement devices before each use. Thermometer is NOT intended for use on people or animals.